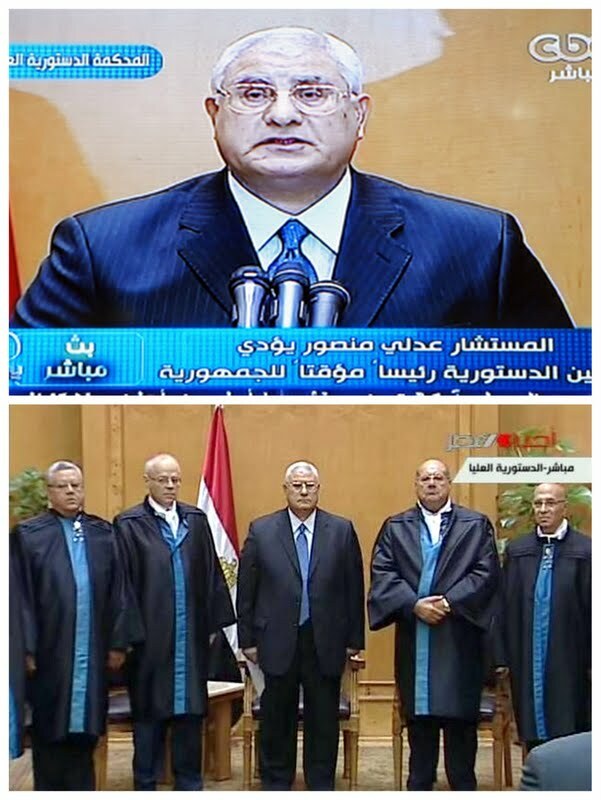 Adly Mansour, head of Egypt’s High Constitutional Court, was sworn in as interim president today after the army ousted and detained Mohamed Morsi, ending the Islamist president’s first year in office. "I swear by Almighty God that I will uphold the republican system, respect the constitution and the law, uphold the interests of the people, protect the nation’s independence and the safety of its land," the oath said. Judge Mansour took the oath of office at a ceremony in the High Constitutional Court (HCC), which was broadcast live on national television. The swearing-in came after armed forces chief Gen. Abdel Fattah al-Sisi announced Morsi’s overthrow on state television late on Wednesday, citing his inability to end the country’s deepening political crisis. Draw up a committee to foster "national reconciliation." The security forces meantime began rounding up senior members of the Muslim Brotherhood to which Morsi belongs. These include the Brotherhood Supreme Guide Mohamed Badie and his deputy Khairat El-Shater, Saad al-Katatni, head of the ousted president’s Freedom and Justice Party, and Rashad al-Bayoumi, another Brotherhood deputy leader. Morsi’s administration unraveled last night after defying the army’s 48-hour ultimatum to come to terms with the opposition. Morsi’s opponents had accused him of failing the 2011 revolution that toppled Hosni Mubarak by concentrating power in the hands of his Muslim Brotherhood. His supporters say he inherited many problems from a corrupt regime, and that he should have been allowed to complete his term, which was to have run until 2016. The Cairo stock market gained LE20 billion ($2.85 billion) in the first hours of trading today as Egyptian investors reacted euphorically to news of Morsi's ouster overnight. U.S. President Barack Obama said he was "deeply concerned" over Morsi’s ouster and urged a swift return to democratic rule. Syria’s embattled President Bashar al-Assad, fighting to crush a 27-month-old revolt against four decades of rule by him and his late father, said the upheaval in Egypt was a defeat for political Islam. "Whoever brings religion to use in politics or in favour of one group at the expense of another will fall anywhere in the world," Assad told his state-run al-Thawra newspaper. "The summary of what is happening in Egypt is the fall of what is called political Islam." The Syrian branch of the Muslim Brotherhood became one of the most powerful factions behind the mostly Sunni Muslim uprising against Assad, who belongs to the Alawite sect, an offshoot of Shiite Islam, and is being helped by Lebanon's Shiite Hezbollah militia. Rosana Boumounsef, in her column today for the independent Beirut daily an-Nahar, says Egypt’s second revolution pulls the plug on using the governance of political Islam as a scarecrow. Ironically, in justifying the course of the latest Arab revolutions, the West expected the upheavals to convulse for many years before producing results that fully meet peoples’ aspirations. Experience and history prove a revolution does not begin and then cool off before ending with parliamentary or presidential elections – especially when such ballots do not fulfill the people’s expectations. Many diplomats recognize they were thunderstruck when they saw millions of Egyptians take to the streets to get rid of Egyptian President Mohamed Morsi and challenge Muslim Brotherhood rule. The diplomats were equally stunned by Egypt’s first [25 January 2011] revolution against President Hosni Mubarak despite international empathy for Egypt’s mounting economic and financial woes. It is therefore imperative -- in light of Egypt’s second [30 June 2013] revolution -- that the West and its analysts and researchers rethink to the hilt their theories about the region going down the road of militant political Islam. They fantasized about the Brotherhood’s rise to power in Egypt being replicated in Tunisia, Syria and all eventual Arab Spring countries. It wasn’t long before they were proven wrong. Liberals are still a cut above the rest in devout and Muslim Egypt. The Muslim Brotherhood did not know how to address Egypt’s multifaceted problems, which are fundamentally economic and administrative. The Brotherhood was caught up in fake successes by laying hands on the seats of power. The Western powers and Russia will find it difficult from now on to invoke worries that militant or fundamentalist Islamic rule, by the likes of al-Qaeda and its followers, could replace the Syrian regime once agreement is reached on its removal. Egypt’s second revolution was not only against the Muslim Brotherhood. It was also a slap in the face of the Obama Administration, which backed and lobbied for the Brotherhood to uphold America and Israel’s interests.